I love earrings, and I love making earrings...if nothing else, they are practically instant gratification! And they are also a great way to use up small quantities of left over beads. Kalmbach Press has a great little book called Project: Earrings which I think you'll like. There are 44 different designs, plus some with variations, in every different style you can imagine. 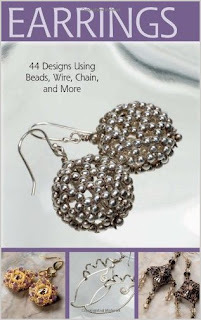 These projects are all by different designers, and have been previously published in either Bead&Button magazine or in the Beading with Gemstones special issue. I love the quality of the projects that have been chosen, and it is really nice to have them all gathered up in one spot. Plus, I swear I don't remember seeing all of these...there are at least half a dozen I want to make now! Maybe over the next few months I'll be able to fit that in and will have some pieces to show you. Some of the designs are beaded or bead-woven, some are made with just wire and chain, and some branch into mixed media. I think you'll be very pleased with this collection if you're an earring junkie like me!